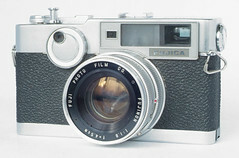 The Fujica V2 is a fixed-lens leaf-shutter rangefinder introduced by Fuji in 1964. It features a coupled CdS lightmeter allowing a speed priority exposure program. The lens is a 6-element 45 mm f/1.8 and the shutter is provided by Citizen. The focusing is handled by turning a thumb wheel on the back of the camera (like the Voigtländer Vitessa).